"A fresh new angle on the world and how we see it, this graphic novel showcases Geary's cartooning style and humor, a style honed in the pages of National Lampoon and Epic Illustrated." Borrowed a copy through Inter-Library Loan. This is a collection of Geary's early work from 1977-1982 gathered from his contributions to the magazines "National Lampoon" and "Epic Illustrated". I've never heard of the second and I was never allowed to look at the first, though I did sneak peaks and saw cartoons of ladies with big bosoms. None of these comics are like that though. Some of these are just comic strips, though not humorous. Some are comedy, but many are little stories and a lot of them are not surprisingly about murders and murderers, though these are fictional stories not true-life like his work now. This does give a glimpse into where his origins began and how he was interested in crime, history and biography right from the beginning. There is an odd "house" theme running through the book; you'll have to read it yourself to see what I mean. Geary's artwork is distinctive and he was working in the style we've come to recognise right from these early days, not much has changed. This was a quick read for me and while I didn't find any gems in here but it's a book I wouldn't miss reading as a huge fan of Rick Geary who is working my way through his backlist. I'm almost finished now. I would recommend the read to other Geary fans, simply for a retrospective look at the artist's work. 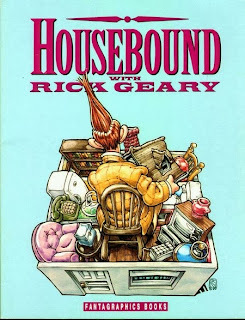 Of note: there is a second book, published earlier called "At Home with Rick Geary". Both books share 78 pages; the remainder of the 95 pages in Housebound and 102 pages in At Home are different. Because of this I'm not going to bother reading the almost identical book.